If the S&P 500 (SPX) takes the five-wave impulse route, it's likely that it will reach the original target zone of 1376-1378. There is another possibility here, though: that of an ending diagonal, hypothetically shown below. With only one wave complete so far, it's just not possible to know which option the market will choose, but I wanted to make readers alert to the possibility, since diagonals are nasty trading environments, loaded with choppy action and whipsaws. 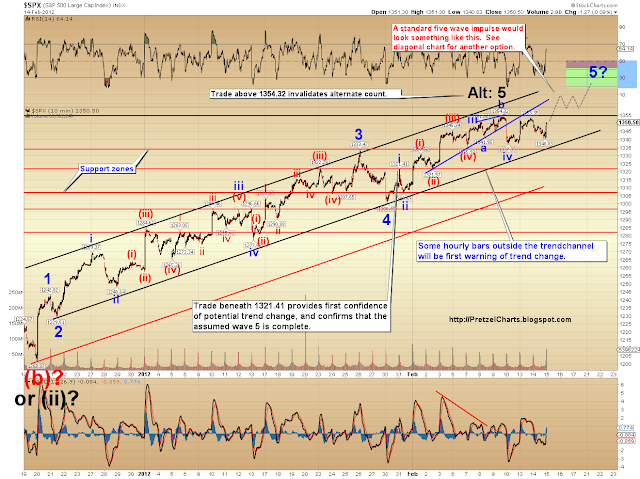 If the diagonal plays out, the market will probably only reach the 1358-1365 area. With the diagonal, watch for a marginal new high next and then rapidly dying momentum and a reversal back into the territory of wave (i). If the rally off yesterday's lows forms what looks to be a 3-wave move and reverses, then we will begin anticipating that the diagonal is forming. Now, both of the above counts are assuming that my preferred count of last week is in fact correct, and that the market is going to make a new high here. As I mentioned some time ago, 1350-1360 was expected to be solid resistance, and so far it has been, with the market now working on its 6th attempt to try and penetrate this zone. For this reason, I would again like to present the Dow Jones Industrials (INDU), because I believe this chart is a little cleaner -- and on the Dow, the key levels close-by. There are two trade triggers cited on the chart, one above the market and one below the market. Again, this could act as a guideline to help anticipate the moves of the SPX, in the event that my preferred count turns out to be wrong. The final chart is the "here we go again" chart. 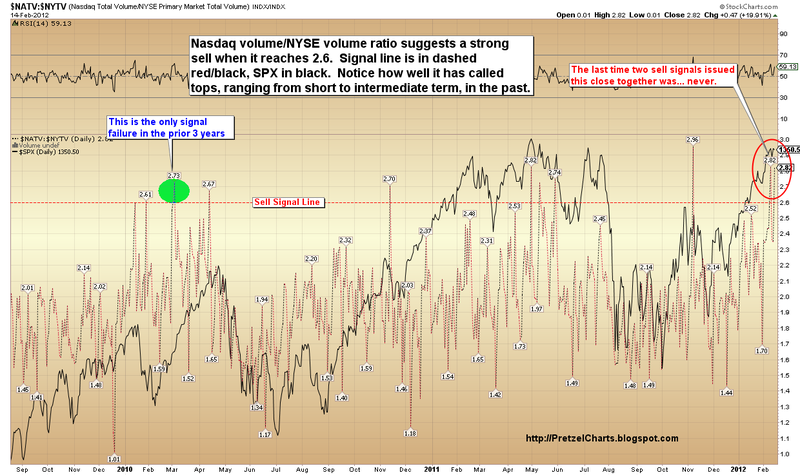 It's the Nasdaq to NYSE volume ratio. For new readers, when investors are betting heavily on the riskier Nasdaq over the more conservative NYSE, it's indicative of extremely frothy bullish sentiment and often marks the blow-off phase of a rally. And when investors get too bullish, it can indicate that there will soon be a shortage of buyers in the market. Bullish investors have already bought in, on anticipation of higher prices -- so once everyone's bullish, there's nobody left to buy stocks, and the supply begins to exceed the demand; thus prices fall. This indicator triggered just a few days ago, on February 9, and has now triggered again for a second time. Two triggers have never happened this close together. So (as if we didn't already know this) sentiment is exceedingly bullish. 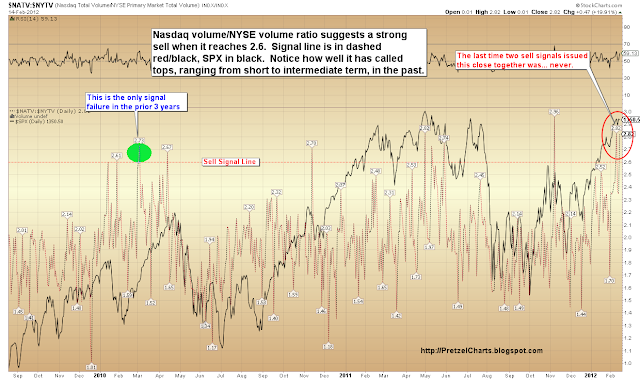 There is more record bullish sentiment info below the chart. Small trader sentiment can also be garnered by examining Rydex funds, which are geared toward the ma and pop investors -- who are, of course, the least informed players in the market. Typically ma and pop get their stock tips from the mainstream media, from "know it all" guys at work, from an annoying brother-in-law, and/or from a Ouija board. So the majority of the time, when very small investors get ultra-bullish or ultra-bearish, the move is almost over. Your annoying brother-in-law (yeah, I've met him) doesn't tell you to buy something until it's already gone up $140, because then he can say he bought it "way back when." Anyway, to get an idea of just how rabidly bullish small investors are: a look at Rydex Nasdaq non-leveraged funds reveals that there is now $80 invested in the bull funds for every $1 invested in the bear funds (!). This is a record extreme, and it illustrates that a ridiculous number of investors are betting on the bullish side of the trade. In a normal market, this would be punished in a fashion that was -- to quote Dr. Detroit -- "most swift and horrible, I assure you." But in this Happy Fun Land market that's being driven almost entirely by trillions of dollars left under brokers' pillows by the Central Bank Liquidity Fairy, it's hard to say how long these imbalances can continue. In conclusion, the expectation is that there are still higher prices to come. At some point, the rally will have to turn, and the market is again near a zone where that turn has an above-average chance of happening. If my wave counts are correct, and these indicators still mean anything, this should be the final leg before a meaningful correction. But again, I don't suggest front-running this unprecedented Happy Fun Land Rally. In the meantime, the key levels outlined on the Dow chart should give some clues as to what's likely to happen next, and that chart provides some short term targets for both bulls and bears. For those only inclined to be bears, a break of the lower trend line boundaries, followed by some hourly closes outside the boundaries, remain the key indicators to watch for a turn. These trend lines are now extremely well established, so it's more likely that the next break will mean something. Trade safe. Nice summary! 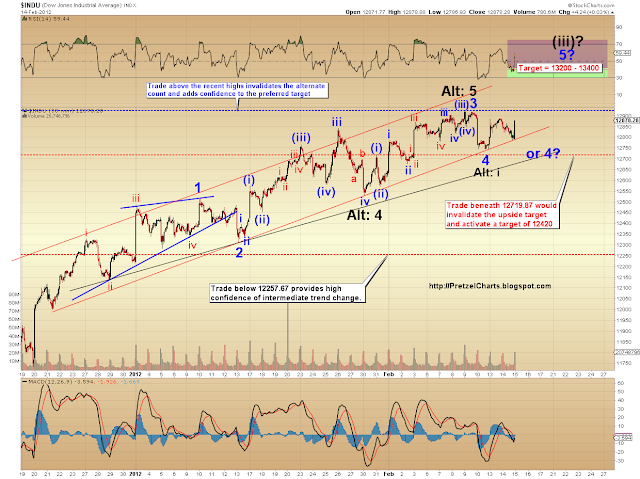 Wasn't SPX 1361 Prechter's protective stop? ty Randall. I think so -- I don't really follow Prechter unless I happen to see him on the news. Morning, katzo. I might be afk for a while here. And may or may not pass out early... I'm really exhausted -- been killing myself with the hours here again. okay, I wil try to talk the mrkt down off this ledge. she will make a real mess we will have to clean up if she jumps. Paralleling other's sentiments expressed yesterday, thnx for all you do for us. Ohhh do I want a nice channel, up or down it doesn't matter but I prefer a down, as you said, more volatility in down moves therefore more chance to reap real profits. Your comment "And when investors get too bullish, it can indicate that there will soon be a shortage of buyers in the market" makes a lot of sense. However, on the 1st and 15th of each month, there is new money from 401k contributions, and mutual fund managers usually go shopping right away. So there can still be quite a few buyers today, and then on March 1st--the day after ECB LTRO#2. Thanks Katzo...I've been looking at $RUT and trying to figure out if it has been making a bull flag since 2/3...any thoughts. A friend said he had been told the markets were "due a correction" and did I know what one was as he'd never seen one. JKGalbreath wrote "the only function of financial forecasting is to make astrology look respectable"
so I'll bear that in mind. But that solid trend line you have nailed is going to be watched very closely. 4 touches already. When is goes and there is a solid daily close beneath it then I might invest a shekel or two on the down side. Enjoyed your post, keep 'em coming. Great post! Thanks for all of your hard work. Since covering all shorts left me feeling battered and bruised I've decided to stay on the sidelines and practice preserving capital in paper trades. The targets you supply are really helpful. Is there a way to post interactive charts to StockCharts.com with your trendlines and annotations? Thanks for a another great post PL...I resemble the annoying brother/son-in-law remark x 2 months. Does it count though if I'm being a contrarian?...and did the TK get there without the TK-sniffing beagles ravaging it? On the DAY? If so, yes, but EW4 which is a bull flag, down to 780-89 looks like the set up now. Then a final blow up to 841 $RUT. Yep...on the day chart. Thank you very, very much. Yup. Gap up. After buying dips for 2 weeks, I will now start scaling out as she heads towards 1368. Thanks for the reassurance Katzo...LOL..My father-in-law will still say that I'm annoying irregardless. I gotta say yesterday's close totally screwed up my very accurate spider's web of trendlines. I know it's just part of the game, but this world-wide QE crap is really annoying me at this point. It's kind of like the card dealer changing decks in the middle of the game. I just hope they don't invoke some BS European-style no shorting rule when this ship goes down. One of my rules is to USUALLY not hold between 3:30 an 4 pm. Only in rare circumstances do I hold during that period. In fact, I usually do not make calls on mrkt direction then, am done way before. You saw why yesterday, lots of cross currents and settling of ETFs, mutual funds, etc. happen then, tough to judge correctly. Yes, you are quite consistent with that. I just Sharpied that rule onto my screen and added it to your list of rules. Thanks for the reminder. Eur is down below 1.31, seems like fx traders think this is funny-money driven. Ok, it's real money, but it's being printed by some funny-looking guys. On January 10, 2012 the Elliot Wave Theorist Interim Report advised traders to short the S&P with maximum leverage and place a stop at 1360. It will be interesting to see if this gets stopped out. "There is no such thing as markets anymore, just interventions"
Nice article, PL. This one is simple enough that even I can sorta understand it. I am one half of ma and pop. Do they have horns or antennae? Did you see where 6 of the 9 components were down in the report and it still managed to beat expectations. Just like all this other data that is so reliable. But yes any print above expectations is reason for a move higher. I queried early this morning, bull flag or a failed EW5. Here is posted chart, Globex. Are there really ads for crispy, old-style pretzels at the top of this blog??? Read SPX was headed toward 1380 a month ago from another source??? Your DIA warning chart box of 13200-13300 translates into a similar target zone, which translates into 1380's. Why have you not labeled DIA chart for the last two days? Is that the first leg you say has not been completed yet? Based on precedents, there seems reason to have marked 1, if not 2 inflection points. Katzo, do you mind posting the chart for TVIX from last time where you talked about the 1-2, 1-2, then break out by looking at July-August? What do you see as the break out level for TVIX? It seems like we have quite a few of TVIX lovers in this blog. good 'ol straight talk right to the core of it article! SPX up, DOW down; 'cause AAPL ain't listed in SPX??? The list I just looked at includes apple in the S&P 500. TVIX w/GLD & UUP. TVIX Seems to be following the dollar. Potential for a significant drop in ES within two hours. Dow negative and Russell and Transports down, all with QQQ and AAPL still parabolic. Euro has also bled back the entire pop. If AAPL fails, look out below on this market. Have you seen anything like this chart of the FTSE today, weird expanding triangles or what? Thanks for looking, when you're rested. and triangle thus ruled out? LOL - I'm working on respectable and immortal. HJ, exactly what I am thinking, and have thought since last week. Scarry. Glad to hear I'm not the only member of the club...Maybe we should have bowling shirts made with that on the back. I think he meant AAPL isn't in the DJIA. Even more telling is that RUT is down, SPX is up. AAPL is propping up the markets. I think that's all you have to do: pump money into the strongest stock (AAPL) and it will provide all the points and associated points in NDX and SPX to keep the musical chairs going. It would explain the NYSE:NASDAQ Vol ratio. Hah hah hah hah hah!!!!!!!!!!!! Looks like I'm already good for infinity! Thx. I was thinking that, but more timidly. EWT already had a max leverage recommendation a couple years ago. This is why I no longer pay much attention to them. my advice, pick one at a time (respectable & immoral). When you finish one go on to the next. . . It's good to get out of TVIX with a profit at this time. The ECB's QE (LTRO) is only 2 weeks away, and this can really kill TVIX. see that blue candle on the TVIX chart I posted. That is an XTL candle, or TREND LOCATER candle (program), blue means an up trend is starting, red means a down trend is starting, black is neutral. BUT, THERE IS NO SURE THING IN JUDGING THE MRKT, WISH THERE WAS. IT HAS FAILED ME BEFORE. There is only one sure thing, that is the direct feed I have from Global Sacks (of cash) plugged into my bot. I spent two years tunneling under the streets of NYC to get this tie-in feed. Shhhh. have you a view to explain the low volume, in your indicator? lol, like the other word better. . .
Just sharing some of my respectability - a little updated. Anyone got any idea why the volume in INDU is 100M when it should be 4-500M? Any view welcome as I'm puzzled. maybe waiting on FOMC minutes and the latest rumor out of Greece? you are funny. here is how I figure it, one cannot do anything about immortality, right. but immorality, yes, there is a chance there. I say, stunnning chart... have you thought of a career in Financial Forecasting? Is this PL's INDU triangle kicking off? potential for this recent run to 51.50 ES finishes up the up move, resetting the indicators to the top. this might provide some punch for the down move I forecast, we will see. above that 51.50 level I will not understand. . . appears ES and SPX are running equal. What is your downside target? Did we pass 51.5 on Ed just now with the ramp to 55.28 in cash? gap covering over. new highs coming. Half a million AAPL call options, expiring Friday, changed hand, today! That translates into 50 million shares. SPX 1357 ? we're nearly there. no break of 1350 ES andf tgt is 1360. IF THIS BREAK through 1350 ES area happens this will be real FAST. What do you foresee during the nest two days for the Greece saga? What do you think this implies? Do you think call writers are desperately covering? Or Do you think that all the current buyers are about to be left high and dry by Friday? I agree. My question was in regard to whether you see something special coming up in the next two days? It is not clear how many calls will be cashed in and how many will be rolled over to further weeks and months. Whoever will be assigned the calls will either exercise and dump, or exercised and sell calls/buy puts. So it is hard to make a call. My take is that shorts are burned badly and will probably stay put to lick their wounds. Longs are not willing to walk in at this moment. 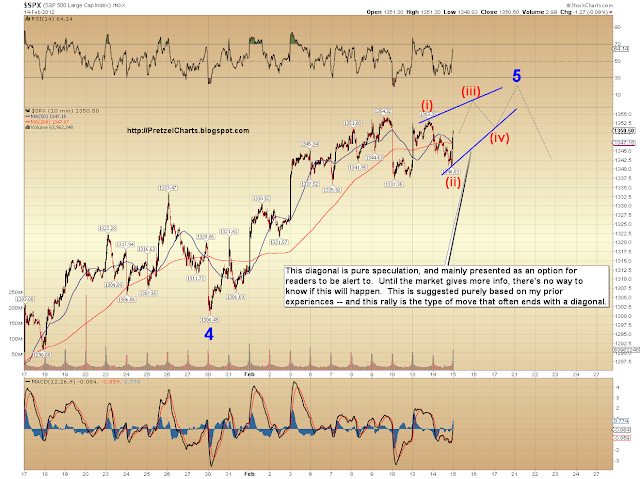 If that happens, then AAPL will spend some time around the 500 level. The dividend issue is keeping everyone on the edge. However, if just a small portion of AAPL shareholders want to cash in, the impact on SPX can be ginormous. do you have a next target for the drop? You are so accurate about that. Here's a link to an article on that topic. It's my article but it was never posted on my shiny new blog although I've been planning on dusting it off and doing that when I find the time. So when I give you this link I'm not pimping my site, lol. But this article sure lays out that entire (and very interesting) AAPL:$NDX relationship. I'm quite confident you'll find it interesting due to the fact that you even mention it. You're aware of it. I actually wrote the following article almost a year ago on Michael Eckert's site and just recently posted it on Seeking Alpha. Anyone seen AAPL? After being up over $10 on the day. You cannot find that type of price action on that stock since earnings. EW may still suggest a higher move. Difficult to fathom based on that movement, that is the first daggar into the bull market. It may not die right away but its definitely bleeding. Hats off to katzo7 for predicting that AAPL would go to around $525/ share. ...and to brianhut for predicting $520 before a meaningful pull back. UKDNY, in my humble opinion, low volume IS an indicator. Bearish. In my humble opinion, low volume IS an indicator. A bearish one. Incredible call, katzo. Nice work. Someday, I hope I can follow your comments in real time (I just check in in the AM, Lunch, and after the kidos are in bed). how is this for a timely call. Said "short ES 52" & "IF THIS BREAK through 1350 ES area happens this will be real FAST." Everybody is nervous about those Fed minutes. If the gentlemen were gloomy, the market will rally. If, however, they are bullish, the market will tank. Opinions? good job again katz. I wish I was able to scalp these moves but my i'm out of round trips (>25k). good job nonetheless. is pretz's ED still in play even though it broke out towards the down side? It is opex wk, which can cloud the picture. Up just 5 points since Monday's open, not very impressive. Even though its positive again AAPL's strong intraday move changed the character of the rally. A number of people buying the Q's are going to get pinched before long. Greece surely has to leave the € for the sake of its people. So very very sad as they are lovely warm welcoming people. Corfu & Paxos mainly, great places. Terrible social impact of this insane currnecy. AAPL high was 526.29, low today was 502.08, it is at 512 now. smart thing would have been to short at 525, that was that 5% rise I mentioned and prolly an EW5 on some time frame with a move like that and get out at 503. BUT, if you missed it you wait. You wait til it retraces up, a 50% run up, then you see how the retrace looks, smooth, choppy, quality. What this is is the EW1 plunge and the EW2 retrace. This is what my teacher taught me, it is the quality of the retrace that will show you what to do. Again, I would avoid shorting AAPL for for the brave souls. . . .
Just wondering if today will be a rerun of yesterday....down big and then ramp in the last 30 minutes....by I hate re-runs!!! Thanks man. You know what happened this morning? I was attacked by a troll who quoted something I'd said yesterday as if I was an idiot or something. I posted that chart and absolutely mopped the floor with the guy. My response got several "likes". And then it disappeared. Can you believe that? Daneric absolutely will not pay attention to the troll problem which has caused 95% of my comments to go into the spam bin due to the trolls flagging my comments. So the Disqus spambots are erroneously learning that my comments are spam thanks to the trolls, but even more due to the blog owner's negligence. It's effecting me on every site where I post these days (if the site is using Disqus). Some of my comments even disappear off this site. But Pretzel spotted at least one of them and released it. In doing so, he taught the spambots that they were mistaken and they learned from that. For Pretzel's action I am grateful. Too bad the moron who runs the other site can't be nearly as responsible. Know what my "home page" is on my computer? My spam bin. The first thing I want to check each day is that none of my innocent followers are being brutalized and raped and urinated upon by the Disqus spam filterbots. And this for you... right back at ya! Do you still see ES testing 1360? maybe after hours? T1 coming up. . . .
Having actually bathed an elephant with a giant brush and lots of soap and hosing, I can tell you that they don't shake the water off. They do, however, have hairs. Very sensitive skin,too. Love having it scratched. Do you think your T2 will be hit today? 36 ES? C'mon, aren't all banksters immoral? aloha, This is for the VXX, TVIX, and VIX option traders. Fresh from the CBOE floor.. Jamie discusses the VXX and TVIX trades today.. very interesting.. great incite . said 20 hours ago "In oscillating mrkts stochs work well to determine entries/exits. Still think this is part of the rounded top, or the Three Peaks & Domed House conclusion. This could take a while but I am tending to play on the short side only (for now) as a break down could occur without notice at any time. IMO one of these times it is going down and it will not come back." Last part is what to focus on, no one knows if this is THE ONE or just a reset to lower before next high. yep agree, I like the Stoch Momentum Indicator at very short timescale, 30s to 1m. Got to be nimble though and only when With the trend and at an extreme. Amazing day Katzo. Nice job! big discrepancy in $VIX (down 10%) and TVIX (down 9.13%?) ???????? TVIX is entirely 30 day futures based on VIX. Spot $VIX will be different than futures in relation. Contango and premium are vocabulary that fits in this discussion. do i risk the +11 points i made and remember we are coming up against me no trade from 3:30 to 4:00 rule. That bump you noted on the chart...I figure it was POMO gone wild. What they're doing is just plain evil. The only good thing is that it has inspired me to write a children's book titled "Where's Corzine". 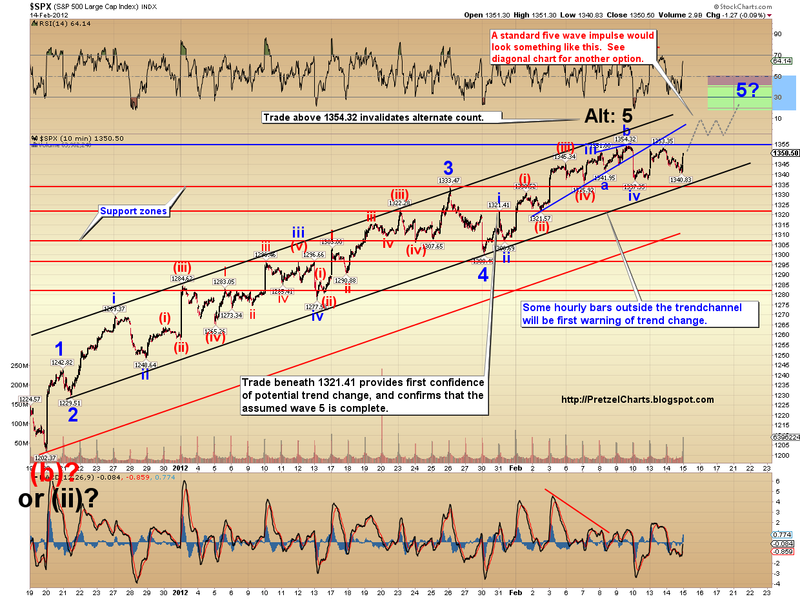 Outside reversal day for SPX? Looks like AAPL is rolling over. yes it can be that simple; this plot has been shown many times now. Remember that AAPL has pretty much single handedly pushed the tech and SPX up for the last 2 weeks. (that's why you saw the DOW down this morning while NDX and SPX were up: that was a tell-tale right there). Given AAPL is ~15% of NDX100 at current levels, you can see that if such a heavy weight goes parabolic up like it has been since the last two weeks; markets go up. So AAPL goes so goes the market. Since all parabolic moves end the same: in tears and at levels where they started, expect the same. FED, ECB or not. I posted a quick study last week on the relationship between AAPL and SPX on a weekly scale, suggesting that a market top was in/near. Given today's action that study still holds. I've attached it again for good measures. Right now SPX is dropping 3-5 points for every 1 point AAPL drops. I'd expect AAPL to test mid to low 400s before rebounding. Unless we trade up or flat for the last hour, the current trend will put the SPX on or below the TL. It's just below at ~ 1340. Its both the natural place to turn back up or the last line of defense for the bulls. It would also mark a 1% loss as well. well, we all saw this day coming for AAPL (and therewith the markets). Anyway, quick word on some earlier posts on people thinking they were exiting their positions too early. Bernard Baruch said it best: "I made money by selling too soon" (which implies that you of course loose money when selling too late!). Stick to that mantra, don't beat yourself up on not catching 100% of a move (nobody can), 50% is pretty darn good. I know day traders with $100K+ portfolios and they still make only 10s of dollars on many trades, and not very often 1000s.... That's how you build a portfolio: PROFIT, no matter how big or small! Remember, we can still be completing a iv here per PL's third chart above. Why would remake yourself after a bot?? You'll become obsolete *so* fast. What happen to the no trading at the last half hour of the market? ;) I wish we hit that target. That would be something!! brought forward to clarify, "One of my rules is to USUALLY not hold between 3:30 an 4 pm. Only in rare circumstances do I hold during that period. In fact, I usually do not make calls on mrkt direction then, am done way before." i'm long term believer in TVIX w a price target of 44.44. i dont like to sell in times like this. if your out of market when it makes THE move, it's nearly impossible to 'Hit the fast ball' out of the park. base hits are fine, but volatility is just starting in my opinion and people will start taking profits as well so it will breathe deeper and deeper and then.. the games begin.. Here we go again. Buy ES @ 3.30. Sell ES @ 3:55. I guess the bulls don't want to play today. Maybe the big boys know something about the jobs report tomorrow. Energy and material was pushing SPX in the final hour. While tech rolled over.